This is a solid stainless steel magnetic anklet. This nickel free magnetic anklet has a powerful & permanent 3300 gauss neodymium rare earth north facing magnet in each link. It has matte silver O centers with shiny 18k gold X accents. This anklet is about 1/4" wide and 1/7" thick. 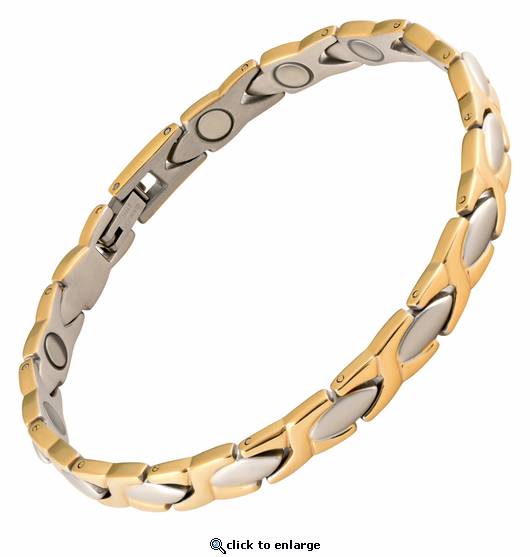 This anklet closes securely with a snap shut clasp. I LOVE LOVE LOVE these magnetic products.! I started with the bracelets and my carpal tunnel is gone. Moved to shoe inserts and my feet feel so much better after 10-12 hr work day. My last purchase was ankle bracelets to help my knee pain. Reading the other reviews it said they help the pain. I have noticed less pain but too early to see if it will eliminate the pain all together. I can\'t decide what my next purchase will be but I will .The customer service is wonderful and shipping is very fast. I\'m always recommending this company to family and friends. got right size, seems to help to relieve pain in my ankle at night. thanks. Lovely bracelet, wonderful customer service and fast shipping. I recommend this company and their products! Love my ankle bracelet and ring. High quality product. Fast service. I have been a customer for for over 25 years! I have worn both a magnetic bracelet and anklet which I never take off ! I know have a 4in1 anklet and bracelet! I have talked many people into wearing 4ih1 bracelets have never been told they dont help! I totally believe without them I would of had to have knee replacement surgery! Since putting a magnetic ankle bracelet back on I no longer am woken up from an aching leg. GREAT! just what I was looking for and needed it is helping my leg and feet immensely. Absolutely love the Anklet. Not only does it look great, but it makes my pains go away!! I am very happy with the quality and look of the anklet. Thanks. I received the extra links and my jeweler added those for me. These anklets are as pretty as gold or silver. I was having ankle and wrist pain from arthritis but as long as I wear these, it minimizes the pain a lot. thanks for the great products!! I get tendonitis in my acilles tendon. I was told I need surgary to get rid of a spur that is causing the tendonitis. I was told to were magnets, so I got my first anklet. Now 14 years later I still have not had the surgary and still pain free. I love how the magnets look like real jewelry now. Thank you. i love the anklet! The only fault i find is it sometimes pinches my ankle when i move. Reply by MJS: Sounds like you have the wrong size. We are glad to re-size for you. Service and products are all good, no issues so far. My wife loves it, very nice looking. Would recommend to all. Stunning, and it really works! I purchased this ankle bracelet in the hope it would help the severe stiffness in my lower leg and ankle. I suffered a severe injury 2 years ago and since then I have been desperate to find something that would relieve the issues with my leg. I ordered this bracelet and have been wearing it for 2 weeks. I cannot begin to describe how much better my leg is, and I am now able to walk without limping. It is probably 75% better. I am so happy it leaves me speechless, with the difference this has made in my life! The quality and workmanship of this anklet is very high. The fit is perfect because of your wonderful customer service. The delivery was quick. I am completely happy with my purchase. Now besides enjoying the beauty of this piece I hope to also reap the rewards of magnetic therapy. I love it and it has helped relieve the pain in my back and leg from Scolisos. Very pretty style also. I absolutely love these. They really do help lessen arthritus pain. Wonderful products. I will continue to order these products! I have not taken them off since I put them on. Don't know if they are working yet but I like them. Classy and best of all affordable. Definitely 5 stars! Originally ordered the wrong size, caught my mistake shortly after ordering and you made the change immediately. bracelet is sturdy, classy and best of all affordable. Will definitely purchase more jewelry from you! Very pleased with my anklet. Very attractive and love the fact that I can wear it all the time, even in the shower. so far it has helped my knee pain. Hope it continues. This is a beautiful, sturdy, but feminine piece of jewelry. I have not taken it off since I received it. Have not figured out if it works yet - :) - but I love it. Just great!! Don't know how I survived without them. I bought this anklet and bracelet in silver for myself and the two-toned anklet for my mother. She wore the anklet for about 4-5 days and loved it. Unfortunately on day 5 a pin fell out of the anklet, separating two links. When I called about the problem I spoke to Lucille who was extremely helpful. I called on Wednesday, by Saturday afternoon I had the replacement anklet with a pre-paid envelope to send the broken bracelet back. Not only is this company selling great products, but they are backing those products up with excellent customer service! I will be a repeat customer. Great job!! I love these bracelets and anklets. More so the bracelets. They not only look good they work. I left the bracelet off one night and woke up one night in pain from my hand that is full of arthritis. I have been so impressed that I bought a set for some one else. And I've told many of my fiends about your products. Thank you very much. I have to say I am very impressed with the weight and quality of each piece. I ordered a copper ring, copper bracelet and an anklet. They are beautiful. I will not hesitate to order again. I have confidence in magnet therapy and copper. So, I look forward to wearing the pieces. THE CUSTOMER SERVICE WAS FABULOUS. Thank you for your care. I definitely rate the jewelry and service 5 Stars!!! I have two of these. They give me relief from the pain I get in my ankles and feet. I am very pleased with them and with your service. I'm sure I will order from you again. I BROKE MY ANKLE ABOUT 10 YEARS AGO AND EVERY FALL/WINTER IT HURTS! NO PAIN AT ALL SINCE I PUT THE ANKLET ON. I HAVEN'T TAKEN IT OFF SINCE. I have had neuropathy in my feet and legs for 5 years. After wearing these anklets for a few days I could feel my feet again!!!! I am sooo happy!!! The only draw back is now I can also feel all the pain again, but after keeping them on for about a month it is also starting to ease off quite abit. Thank you soo much!! !